Agence Arguenon is a family immobilier business that's been established since 1991. And it's a business that has no doubt about its priority. That's you, the client. Nothing is more important than client satisfaction, and therein lies the secret of the agency's success. The testimonials on the website make this very clear. Agence Arguenon has built a reputation for excellence from many years of experience and a deep knowledge of the area in which it operates. The eleven-strong dedicated team has a good understanding of the challenges faced by British buyers (and others from abroad) seeking property in France. They help to provide everything you need to make your dream home a reality. Finding and buying property in France isn't always as easy as it sounds. Yes, there are many happy ex-pats and holiday home owners already established in France, but few will tell you that they did it all alone, or that it was easy! Agence Arguenon takes away the difficulties one by one from the first contact you make with the agency. The bi-lingual team assess your requirements and match them to properties they know well. So, you don't waste valuable time and expensive viewing trips on properties that aren't what you're looking for. They'll support you every inch of the way, translating, accompanying you on viewings and holding your hand throughout the complicated buying process. Unusually, Agence Arguenon also offers official document translation in addition to verbal language help. Agence Arguenon's service even extends to giving you very useful, friendly support to find your feet after the sale's gone through. It can be surprising just how much there is to do, in those frenetic, early days. You might need help getting connected to utilities or understanding how to register your kids in school. You might need contacts for artisans and tradesfolk if you're renovating. It can be daunting, especially if you don't know the area and don't speak the language. But you can trust Agence Arguenon. The team have done it all before. Their service extends far beyond traditional estate agency, and as they say, their door is always open to welcome clients in need of their assistance. What's special about northern Brittany? If you need to ask the question, you probably haven't been there yet! 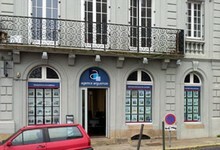 Agence Arguenon covers northern Brittany, but mainly the Côtes-d'Armor department around Dinan and Lamballe. And according to Megan Byron, who works with the agency, the area covered by Agence Arguenon is about as close to paradise as it gets. You can choose from coast or countryside, tranquil villages or lively towns like the stunning mediaeval Dinan. There is history and heritage everywhere, along with a unique Breton culture. The fresh, green countryside is unspoiled and delightful, and the coastline stunning. Resorts such as Erquy offer seaside fun for families, while character fishing villages like St Jacut suit those looking for a traditional Brittany. Of course, convenience of travel from the UK counts for something too. After all, no one wants to waste hours of weary travel when a dream home awaits. So, it can only add to northern Brittany's charms that it is so easy to get to, whether by plane to Dinard or by ferry to St Malo. The area is perfect for weekend getaways and short breaks if you can't spare the time for a longer stay. And, should you be relocating permanently to Brittany, you'll be able to welcome family and friends to stay easily too. Properties come in all shapes and sizes - and all price brackets! Agence Arguenon doesn't limit itself to any one sort of property, so it will help you to find your perfect place whatever you're looking to spend. What's more, the team understand the local people and attitudes, so they can help you get so much more than agents from elsewhere. For example, a client recently bought a semi-detached house through the agency. The house had a disused barn attached. Using their contacts and local knowledge, Agence Arguenon's team traced the owner of the barn and secured a sale to their clients who are now the proud owners of not just a small, semi-detached house, but a substantial detached residence! If you're looking for a bargain property, or don't have an inexhaustible budget, Megan advises concentrating your search inland. The coastal towns tend to be more expensive, but even inland you're never going to lose out. The countryside is beautiful, and nowhere in Brittany is too far from the sea anyway! Agence Arguenon has worked with property portal French Property Links (FPL) for eight years, and it's a proven partnership. Megan likes the fact that the portal provides quality contacts rather than time wasters. She also says that Agence Arguenon approves of FPL's user friendly design and simplicity. In turn, FPL are delighted to work with an agency that generates so many satisfied clients, so it's a happy situation all round!